Are you an apple, pear or the latest fruit to be included in the mix – an avocado? Why is it important to know which fruit shape you are? Well apparently the distribution of your fat is a valuable predictor of your risk for Type 2 diabetes, stroke and heart disease. While BMI (body mass index) is a good way to tell if you are at a healthy weight, it doesn’t tell the whole story as it doesn’t take into account where you carry your extra weight. The fairly new kid on the block is “Waist-to-Hip” ratio. In this post I will share with you how you can work out your ratio to determine whether you potentially have the shape with the most health risk. All you need is a fabric tape measure, a pen, notepad and a calculator. Using the tape, measure your waist at the narrowest point, which is usually just above your belly button. Write it down. Next, measure your hips at the widest point of your hips and bum. Write that down too. 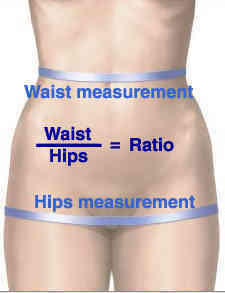 Now divide your waist measurement by your hip measurement and you will get your Waist-to-Hip ratio. If like me, you have a real aversion to maths in any shape and form ,then click here for an online Waist-to-Hip ratio calculator. Ok, now you have a ratio. Where to from here? Here is a table which I found quite useful in interpreting my result. Apples carry most of their weight around their tummies which means they also have more fat covering their internal organs (visceral fat). The bad new is that apples are the ones most at risk for developing health issues. Having a big tummy increases the risk of having metabolic syndrome, which in turn increases the risk of diabetes, coronary artery disease, stroke, dementia and some cancers. The good news is that you can get away with wearing skinny jeans. 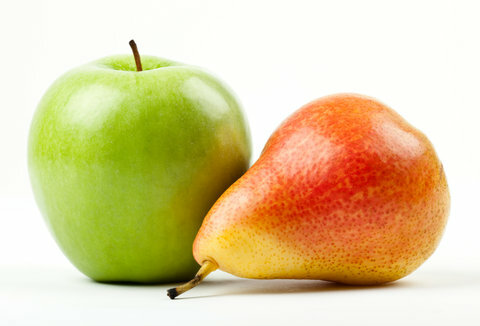 Pears on the other hand, carry most of their weight around the hips, bums and thighs. You might never look good in skinny jeans but the good news is that this fat distribution doesn’t come with as many health risks as an apple shape. Your fat is mainly subcutaneous (under the skin) and fortunately does not cover any vital organs in the way that visceral fat does. An avocado shape is somewhere in-between, with health risks greater than a pear but less than an apple. So …. you just might be able to wear skinny jeans. Mmmm… debatable issue that one. The potential to look like a pork sausage bursting out of its casing is still relatively high. Being an avocado myself – I speak from experience. Calculating your Waist-to-Hip ratio is easy and doesn’t cost a thing. Is your health possibly more at risk than you think? Knowing your ratio might be what gives you the motivation to finally do something about that beer belly or spare tyre. The ‘6-month pregnant’ look is not just uncomfortable but it can lead you down the path of ill-health and disease in the future. Don’t ignore the signs, especially when there is still time to do something about it. Watch this short video about the dangers of belly fat from the TV show, The Drs. 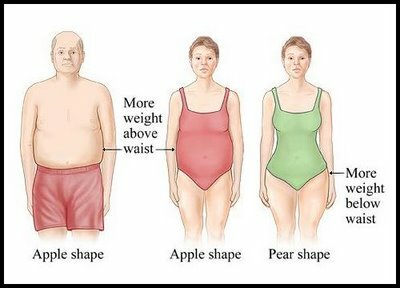 Posted on March 21, 2014, in Primal 101 and tagged apple shape, body shape, pear shape, visceral fat, waist to hip ratio. Bookmark the permalink. Leave a comment.